Founded in 1521, San Juan is rooted in history. 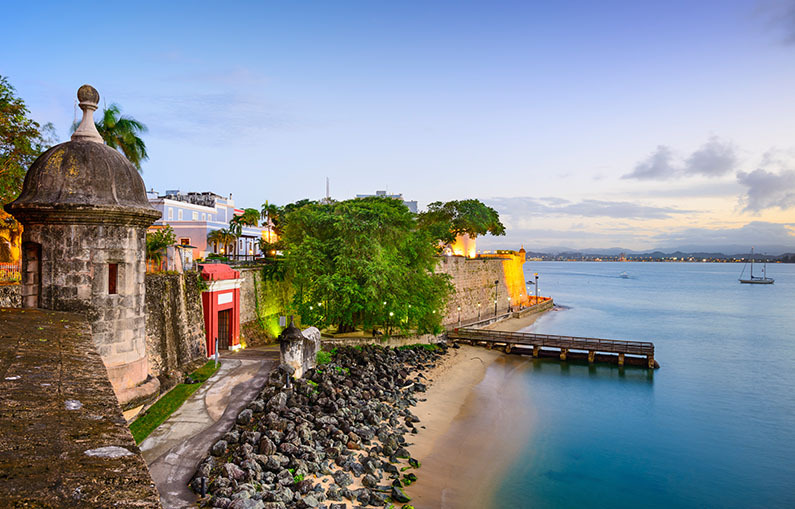 Old San Juan offers insight into Puerto Rico’s past, and houses colossal fortresses and vibrant Spanish colonial buildings within its cobblestoned streets. Take a day trip and return to San Juan’s gorgeous shores, with the Isla Verde resort strip boasting active nightlife and exquisite ocean views. A secluded monument, the Capilla del Santo Cristo is a tiny chapel nestled amongst the cobblestones of Old San Juan. In 1753, the chapel was built on top of the walls that protected San Juan, and its structural integrity has endured. Legend has it that the chapel can inspire similar miracles, and thousands of visitors flock to test its powers each year. Drenched in fervent sunshine and the storied history of Puerto Rico, Castillo San Cristobal serves as the land entrance to Old San Juan. Explore one of the first sites of the Spanish-American War, where soldiers paced the grounds over two hundred years ago. With tours offered in many languages, all can discover the richened tales of Puerto Rico’s beginnings. Originially built in 1853, Paseo de la Princesa is a splendorous site located in Old San Juan. The promenade inspires incredible strolls amongst its tree-lined path (and is a premier spot for people-watching). With food vendors offering live music on certain evenings, Paseo de la Princesa is a vibrant stretch of land that serves as the contrast between the Old San Juan and San Juan Bay, which border on either side. San Juan Beaches offer an unblemished oasis. Sip a tropical drink, relax in the buoyant, crystal-clear waters, and take a break—San Juan’s beauty is to be experienced best on the beach. To plan your trip to San Juan or for an extended guide of things to do, visit the official San Juan city guide at http://sanjuanpuertorico.com.